Path of Exile has grown into a brilliant, sprawling action-RPG that keeps on changing. 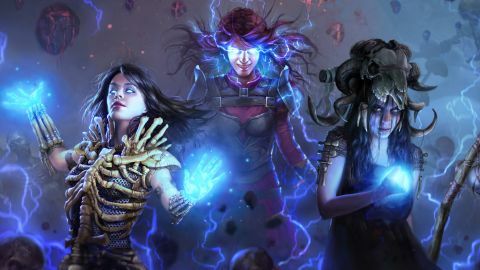 Path of Exile was a great game in 2013, but a slew of free expansions have only made it better. It’s one of the best ARPGs out there, and absolutely the best value. We originally reviewed Path of Exile in 2013. It has changed significantly since then, so much so that we decided to review it again. Our original review can still be found here. For more about why we've chosen to re-review certain games, head here. A rare moment of peace and quiet. Many areas are randomly generated, so grind for loot to your heart's content. It's a pretty big map. I get to just run around like a headless chicken, avoiding projectiles or getting swarmed by enemies, while my totems and the occasional summon do absolutely all the work. While this does make an already daunting skill tree even more complicated, there are plenty of builds for new players, along with build walkthroughs, which go a long way to explaining Path of Exile’s elaborate but hard-to-parse progression systems. Steven has also put together a great list of starter builds created by Path of Exile boffins, which includes the the Hierophant build I’ve been using. Path of Exile is a laboratory where you create terrifyingly powerful heroes before unleashing them on unsuspecting packs of monsters. While we’re on the subject of glittering, shiny things, Path of Exile's skill gems are one of its most subversive designs. Because Path of Exile's classes aren't structured playstyles, there are no preordained abilities given to each one. Instead, looted skill gems are where you get your active abilities—assuming you meet their stat requirements. To use a skill gem, you have to place them in item sockets of the corresponding colour. Some items won’t contain any sockets, while higher level items can have six—making them exceedingly rare. In a way, skill gems are like a form of spell crafting. If the sockets on an item are linked, you can slot multiple gems together and they'll share each other's effects. My Hierophant creates totems, for example, by combining a spell with the Spell Totem Support gem. Now, instead of casting a fireball with my hand, I create a totem that does it for me so I can focus on not getting impaled by a demon. More links mean more possibilities, letting you create all sorts of brand new spells with increasingly complicated synergies. There’s something pleasingly tactile about it, too, like you’re constructing spells by hand. Eventually you’ll be a one-person apocalypse, and the spell effects look the part, liberally filling the screen with magic and destruction. Path of Exile is a laboratory where you create terrifyingly powerful heroes before unleashing them on unsuspecting packs of monsters, essentially. The poor things. They can put up a pretty good fight at times, however. And Path of Exile's toughest bosses are more akin to bullet hell shoot 'em ups than classic RPGs. While Leagues are temporary, they also serve as testbeds for experimentation, introducing new features that become mainstays. In our original review, Tom called the free-to-play model “wonderfully generous,” and it’s only become more generous since launch. Not one expansion or feature costs money, while the in-game shop’s only item that isn’t purely cosmetic just expands the size of your already large stash. If you don’t want to spend a dime, there are few games that offer this much.